Speedwitch Media Wabash Automobile boxcar. Charlie Duckworth returns with comments on a pair of interesting resin kit builds. The Wabash had a large fleet of single-sheathed automobile boxcars starting in the 1920’s and running these well into the 1950’s. The designs were basically standardized with radial roofs, wood or steel doors, and Murphy or Dreadnaught ends. These were tall cars having 10-foot high interiors. Wabash 46000-46999 had 5/5/5 Murphy ends. The 47000-47999 had 3/3/3 Dreadnaught ends. Another group numbered 17000-17299 had Dreadnaught automobile end doors. For prototype photos and additional history, consult page 80 in ‘Focus on Freight Cars Volume One: Single Sheathed Box & Automobile Cars’ by Richard Hendrickson. 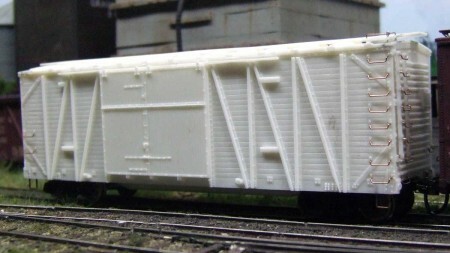 Speedwitch Media’s Wabash boxcar is about as close to an injected plastic model as one will find. The one piece body was molded perfectly. The sides were straight, unlike some one-piece resin kits I’d purchased over the years having sides that bowed in. I was an art major in college so I appreciate Ted Culotta’s decals being ‘right on the mark’ for the Wabash. There were no computer generated ‘this is close enough’ fonts used here. This was an enjoyable kit, although the end ladders were a challenge to build but I kept telling myself “this is a hobby” and got through it. I used Tru-Color Wabash Box Car Red for the carbody. Prior to applying the decals, I spray Tamiya clear as it gives a high gloss finish for decaling so you avoid any issues with silvering. The top coat is Testors Dullcote with chalk marks added using a white pencil. Light weathering was added using military pigments. 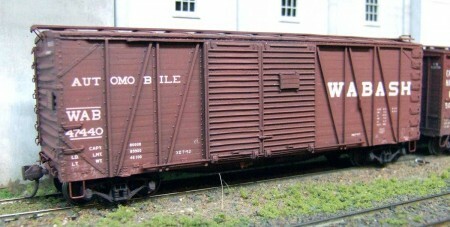 Funaro & Camerlengo Wabash Automobile boxcar. I built a Funaro & Camerlengo boxcar when it was a flat kit. Steve now offers it as a one piece body. The parts went together quite well although I remember having to file the bottom of the doors and tops of the rollers to get the doors to sit flush against the ‘Z’ bracing. As the Wabash didn’t use ladders one does drill a lot of holes in these two kits. The F&C parts were cast in white resin making it almost impossible to see the marking for the holes. To make it easier, I sprayed the parts with Tamiya primer gray so I could see the details and drill in the right places, although the gray certainly doesn’t show in these photos. Rather than making a second Wabash car I decaled the F&C model as an NJI&I using Mark Vaughan’s Wabash steam era boxcar decal set. I needed to remove the lower door stop to get enough flat surface to apply the NJI&I reporting marks. 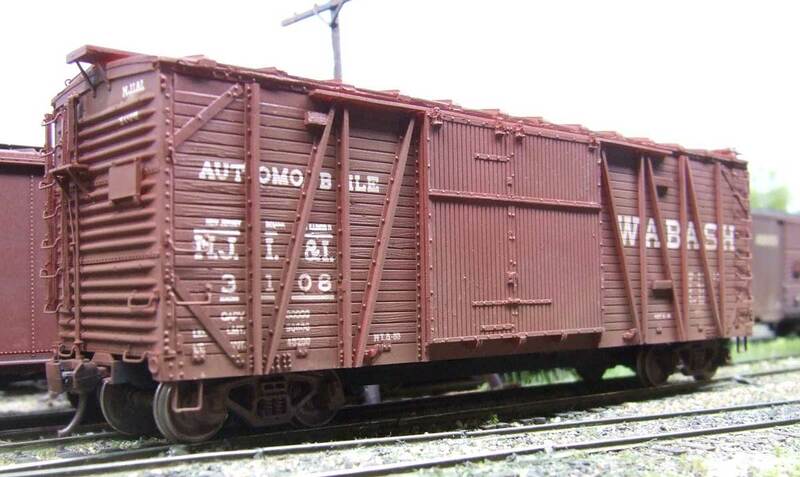 As with the Speedwitch model, I used Tru-Color Wabash Box Car Red but finished it using Tru-Color’s Flat. Both models are in regular service on my home layout. Thank you, Charlie, for sharing your work here on the blog. Check out Charlie’s website for layout photos and Mopac info. Questions and comments can be posted below. Please follow the instructions so your comment can be posted. All comments are reviewed and approved before they appear. I just read in the NYC Modeler Magazine that a NYC offset hopper, 1937 to 1945 has been developed in cast resin, is now complete with decals. You have any ideas as to this person is? How did this hopper get put together without plans?